Over the centuries, the river Taff has shaped the development of Cardiff. At the same time, Cardiff’s growth reshaped the river Taff. A 1548 document says Cardiff is “uppon the water of Toof, by reason of the great rage of the streme there”. The Taff is a short river but collects water from a hilly, wet area. The copious water was both a help to Cardiff – powering its mills, for example – and a hindrance, causing frequent flooding. Bridge maintenance was a recurring headache in Cardiff and upstream, for example in Pontypridd. As you stand at the top of the steps which lead down to the landing stage, look down river (southwards) along the near bank towards Castle Street bridge. Where the concrete embankment gives way to grass, you can see old stonework – the remains of an 18th-century bridge. The original Cardiff Bridge was built of wood, a little further north. Masonry piers were added in 1579. By 1790 the bridge was entirely of stone, but one of its piers collapsed in 1792. 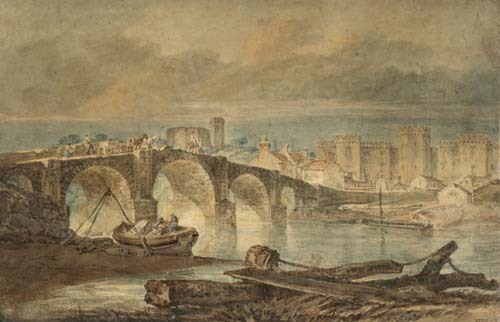 The painter JMW Turner recorded construction of a new bridge in 1795-96 which changed the line of the road into Cardiff from the west. A map from 1610 shows the river curving eastwards here, towards a couple of ships depicted at “The Key”. At that time ships docked on the river, at the foot of the slope still known today as Quay Street. Floods wreaked havoc, especially on the small businesses along the Taff’s east bank, and in 1797 Cardiff’s magistrates recommended digging a new channel alongside what is now Bute Park, to keep the Taff flowing on a predictable course. In the first half of the 19th century, shipping was transferred to new docks near the rivermouth, and the Taff was diverted well away from the old quays. The Taff continued to flood Bute Park and nearby areas in the 1970s, a reminder that the park occupies a former flood plain. Flood prevention measures were installed in the 1980s. In 1999 the Cardiff Bay barrage turned this section of the river from tidal (the water rose and fell with each tide) to a constant level. This paved the way for an aqua-bus service along the river and to the Bay, for which the Bute Park landing stage was built.